You might have heard of anthropomorphism or just "anthro" as a term related to furries before. In this case it has (almost) nothing to do with furries. Anthro means "human," morph means "to change into," so anthropomorphism means "to change into a human." 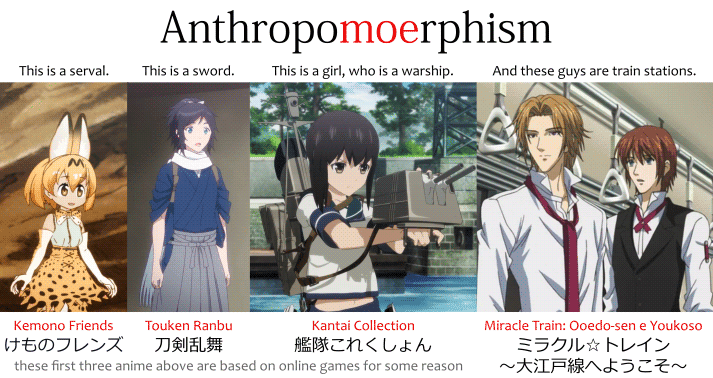 Therefore, moe anthropomorphism would mean "to change into a moe human." In other words, the practice of drawing things, any things, as humans who are moe. This includes turning them into cute girls, or boys as well, or maybe not even "cute," but something else entirely, like "cool," etc. So this practice includes turning animals into cute girls, which might be "furry," kemono ケモノ, (might not, too,) and it also includes turning mystical creatures, objects, vehicles, websites, yes, websites, organizations, and literally every singe last thing in the whole universe into a cute girl. A number of terms overlap with moe gijinka 萌え擬人化. 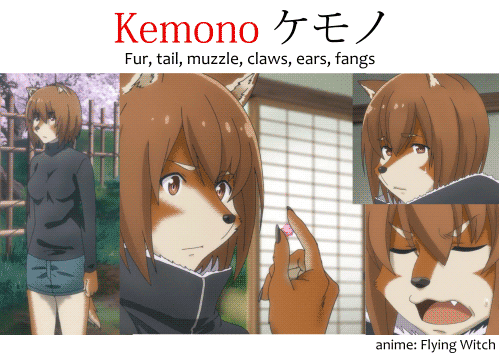 First, moe anthropomorphization of animals can sometimes be considered "furry," kemono ケモノ. Sometimes, however, the characters end up with just ears and tail, which, by some, wouldn't be called furry. For example:, cat anthropomorphized into a girl can have just "cat ears," nekomimi 猫耳, or, in the case of other animals, kemonomimi ケモノ耳. Such characters are also sometimes labelled jingai musume 人外娘, "non-human girl," which labels any girl character that's non-human, including monsters and chimera created from crossing humans with animals. A specific type of jingai musume are "monster girls," or monster musume モンスター娘, which refer specifically to the anthropormophizations of monsters of RPG and fantasy games. Lastly, Super Mario characters that have been turned into princesses by donning the Super Crown, like Bowsette, are said to have undergone "peachification," Piichi-hime-ka ピーチ姫化. An entire zoo of animals. Red blood cells, platelets, macrophages, pathogens, etc. The above are just examples. They have anthropormorphized a whole lot more. More than the mere human mind can ever hope to imagine. They have anthropormorphized... everything. A trend surrounded by moe anthropomorphism is the creation of moe mascots to represent brands. This is often done without the acknowledgement of said brand. People on the internet just take a logo of the brand or something and use as basis to design a whole cute girl from it. In other words: it's a meme. 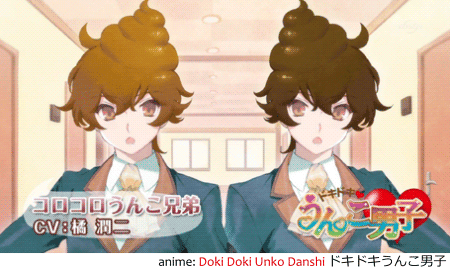 These made-up mascots usually receive the name BRAND-tan or BRAND-chan. The -tan suffix is used mostly by otakus toward cute characters and idols. It's like the -chan ～ちゃん honorific, but a bit weirder. Pretty much every browser, too. Of course I couldn't leave this out: Earth-chan, the moe anthropomorphization of the whole planet Earth.